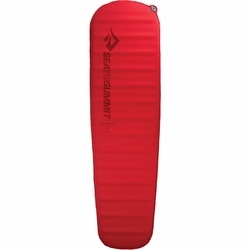 Sea to Summit Comfort Plus SI Mat. The Comfort Plus SI series combines the comfort of a 3 inch air mattress with the support and self-inflating performance of a foam core - without the expected weight penalties. This is made possible by Sea to Summit's Delta Core™ technology, which removes the optimal amount of foam without sacrificing support or durability. Constructed using DeltaCored™ foam. Large, horizontal delta-shaped cores are removed from the foam, achieving 40% reduction in weight, creating an amply thick mat while minimizing weight. Features Sea to Summit's patent-pending multi-functional valve. High flow rate for easy inflation; one-way deflation mode prevents re-inflating while packing up and finetuning bleed valve for customized comfort. 30D stretch knit polyester fabric top allows the mattress to conform to your body weight for an extra soft and comfortable feel. 30D plain-weave base with anti-slip silicone print to help keep your mat in place. With an equivalent R-value of 3.2, the Comfort Plus SI Mattress also delivers the performance and warmth required for cold weather expeditions.